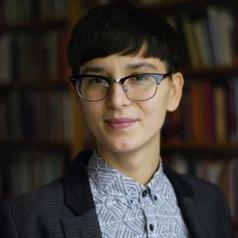 Marianna Szczygielska received her PhD in Comparative Gender Studies at the Central European University in Budapest. Her doctoral project, awarded the Best Dissertation Award at CEU, examines how the concepts of nature, animality, and humanness have been constructed in relation to sexuality, gender, and race through the establishment of the modern zoological gardens. During her PhD studies she was a visiting researcher at Tema genus, Linköping University (Visby Fellowship, Swedish Institute) and the Faculty of Environmental Studies, York University (Toronto, Canada). She was awarded the Feminist Animal Studies Fellowship in honor of Marti Kheel at the Wesleyan University (CT). Marianna has been a Postdoctoral Research Fellow at the Institute of Ethnology of the Czech Academy of Science and CEFRES French Research Center in Humanities and Social Sciences in Prague within the Bewildering Boar project. In the 2017–2018 academic year, she worked as a visiting lecturer at the Central European University and Karl-Franzens-Universität in Graz. Marianna's current research project concerns the complex intersections between post-socialism, post-colonialism, and post-humanism at the site of the zoological garden. With a focus on the history of keeping elephants in captivity in Eastern Europe and the traffic in ivory, this study explores various understandings and practices of nature conservation and environmental politics, as well as their critical impact on the larger structures of identity formation. At Max Planck she is a member of “The Body of Animals” working group in Department III. She has published on animal collections and gender, scientific research on hormones, relations between affect, transgender, and animal studies. With a background in philosophy her research interests include environmental humanities, animal studies, queer theory, critical race studies, philosophy of science, and feminist STS.